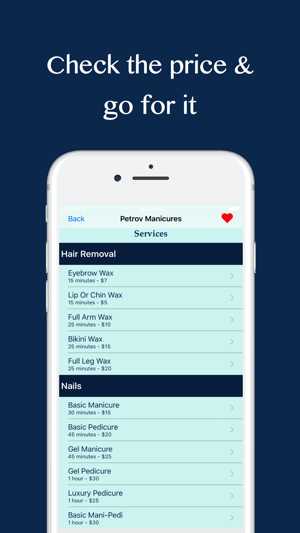 GoSpa provides the first “on-demand” service model for salon services. You can even book NOW! 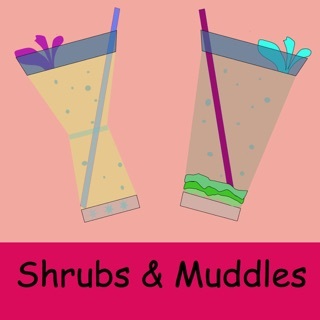 Have you ever tried to fit manicure or hair appointments in between work and kid activities? The options are to make an appointment, before you know where you are going to be at that time or go to a salon during a break and hope for the best. There are many lost opportunities for this exchange of money for services. Appointments are missed or cancelled due to changes. Other appointments are not even attempted. For the walk-in model, you often have to walk right back out of the salon having missed your mani/pedi opportunity for the week. And the beautician has missed out on dollars earned. The solution is GoSpa. 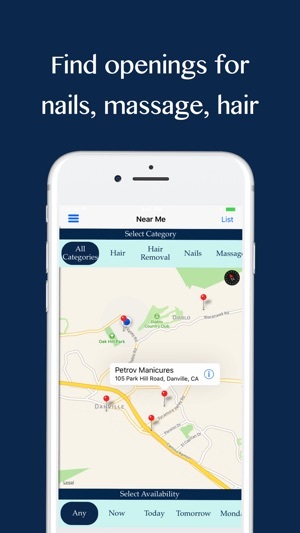 GoSpa Service Providers can post their free times and busy potential clients can see available appointments nearby. It's that simple. 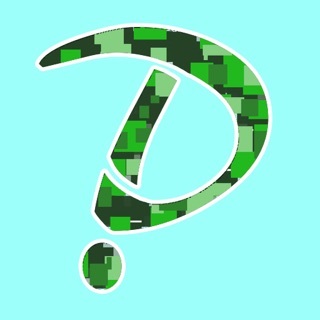 As a service provider, do you have gaps in your schedule that you would like to fill with a paying client? Would you add time to the beginning or end of your day, if you could get more appointments at these edge times? Options (such as allocating walk-in clients to you) are sometimes provided by the Salon Owner or greeter, which may have an arrangement to charge the user more or to take a referral fee. With GoSpa, you do not have a monthly service fee, nor is there a time/cost element for the Salon Owner or Greeter. So, you can run your own business purely by downloading the app and publishing your available times. You can even use the “Available Now” toggle button and you will be immediately discoverable by interested clients. Interested clients could be standing outside your Salon (or anywhere). 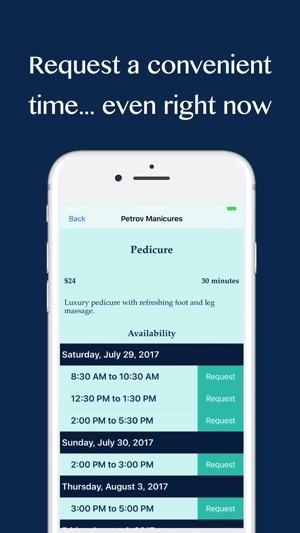 The client selects an available time (such as “now”), selects a desired service (such as Manicure) and the phone’s text application opens with a pre-populated message. A sample message could be: “Hi Jessica at Petrov Salon. 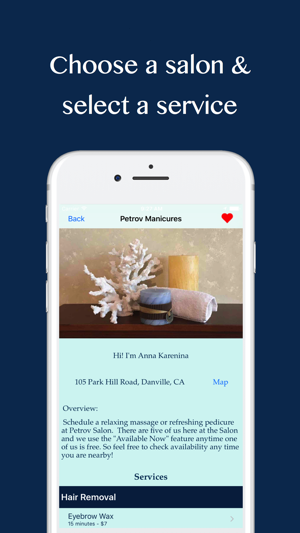 From the GoSpa App, I see that you have a Manicure appointment available now. Can I book that?” Even if your first language is not English, the App provides a clear message that you can respond to with Yes or No. Try it. There is no risk. And early adopters could end up with the benefits of more clients. Bug fix for the iPhone X style. I'm so busy all the time. Use this approx once a week , it's great for my schedule because it's sup easy. Very functional and easy to use. Best idea for scheduling nail appointments! I've tried a few and this one is really easy to use for me.